My kids have always loved trains, and the Polar Express has always been one of their favorite Christmas stories. 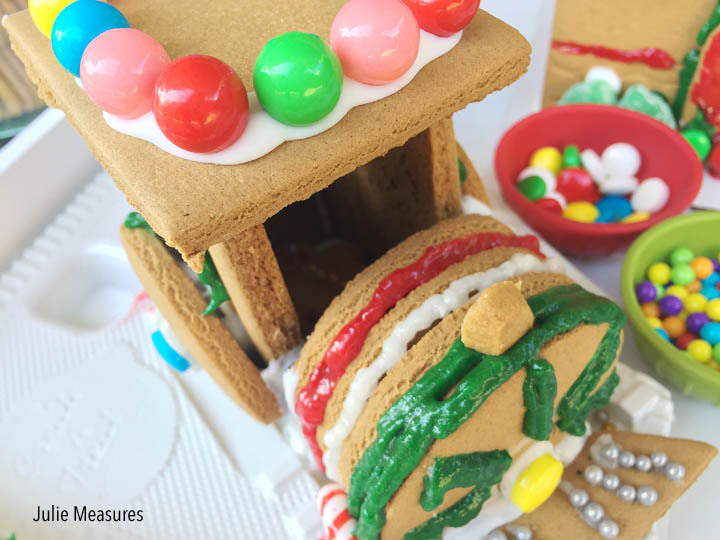 So this year it’s all aboard for a gingerbread train decorating party. Gingerbread building and decorating is an annual tradition for my kids. Every year my kids spend a day with their Grandma where they build gingerbread creations. 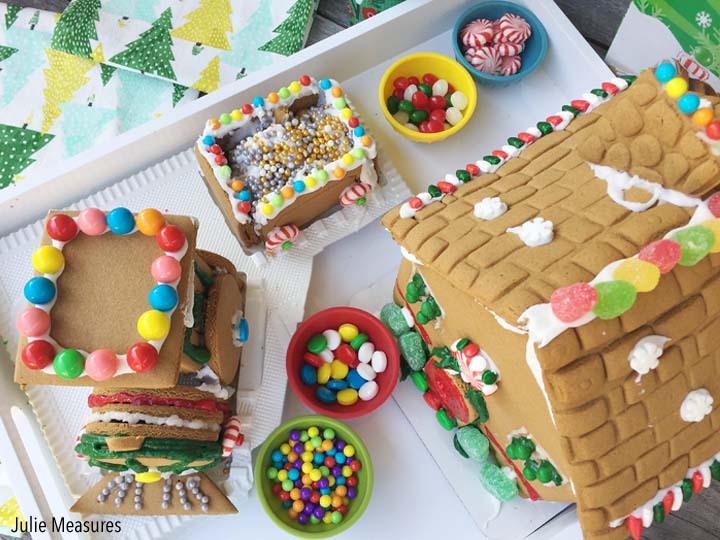 It started with houses, but it didn’t take long before they were building gingerbread airplanes and entire cities. And of course a few gingerbread trains. The gingerbread creations have become one of the centerpieces of our Christmas Decorations. This year it’s all about the trains. 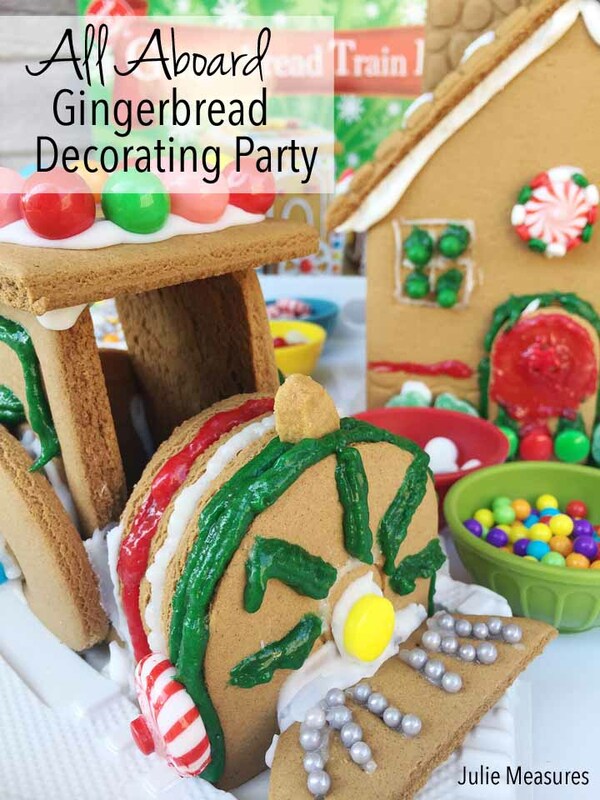 A gingerbread train decorating party that goes perfectly with a showing, or reading, or both, of the Polar Express. 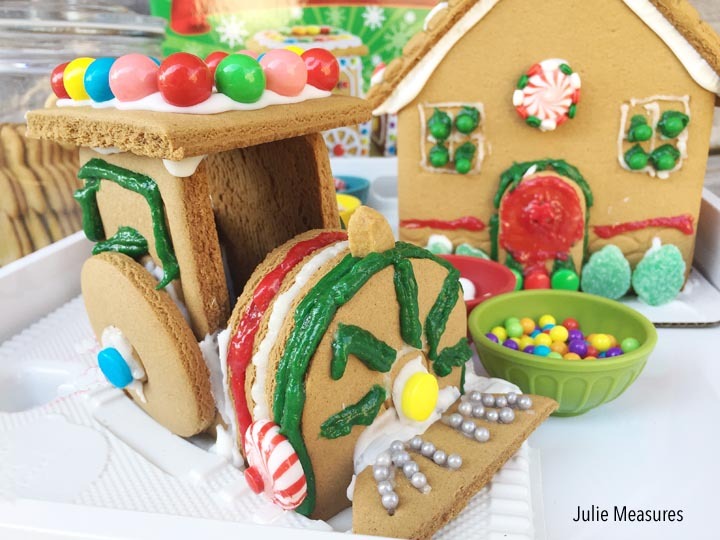 If you’re a little concerned about putting together a train versus a house, I picked up my Gingerbread Train Kit at my local Cost Plus World Market (in Arlington). 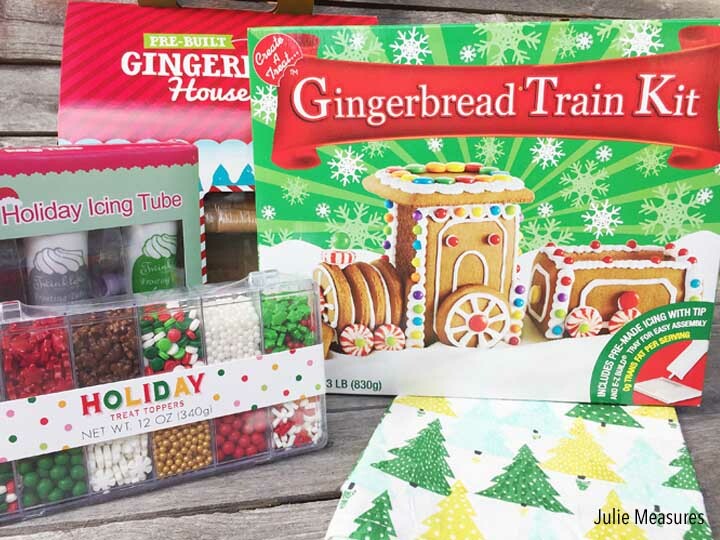 Knowing that multiple kids would be decorating our gingerbread train I also picked up a package of Holiday Treat Toppers and Holiday Icing Tube that actually had three tubes of icing in red, green, and white. And, just to be on the safe side, I also got a Pre-Built Gingerbread house and a few Kitchen Towels. I opened all of the different decorating supplies and put them all in a white tray, to keep everything together. Then I let the kids start creating! The Gingerbread Train Kit came with a tray that made assembling easier. Over the years I discovered that decorating the gingerbread creations was way more exciting for the boys when they were younger than building the creations. Which is why I also picked up the pre-built gingerbread house. Then those who aren’t assembling trains, or would just rather decorate, can start doing that right away. Just keep the kitchen towels close by for kids to wipe their hands on! Another tip I’ve learned is to have plenty of gingerbread cookies on hand while you decorate! 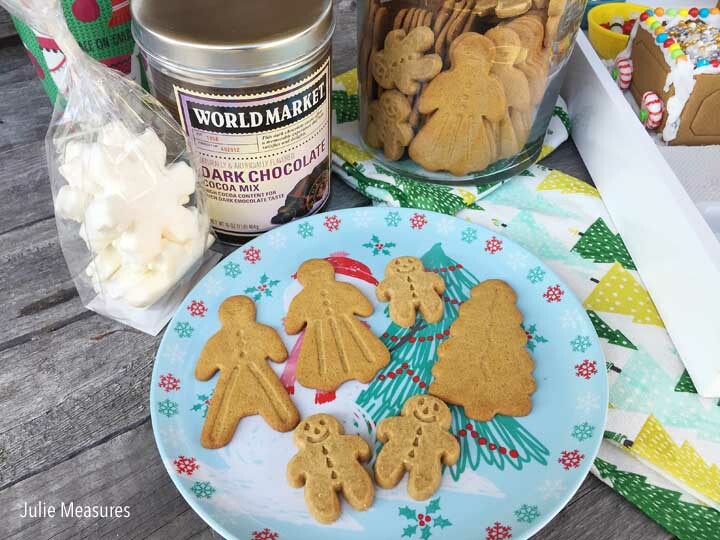 I filled up a glass jar with the gingerbread men and put a few out on Christmas dinnerware. 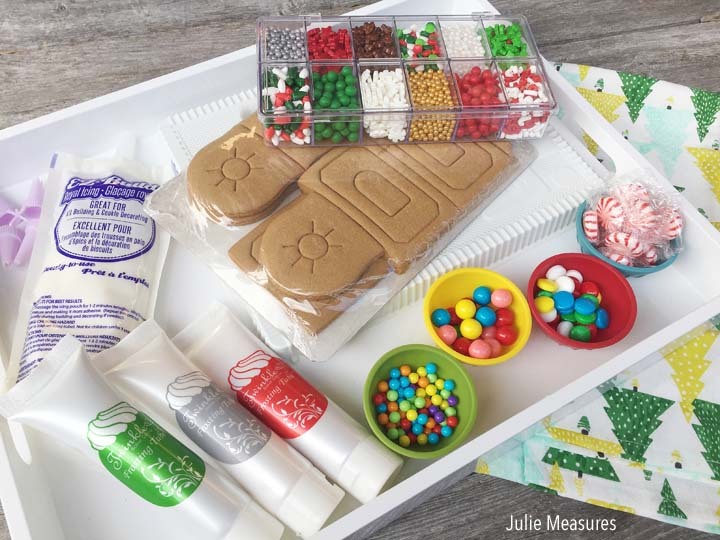 That way you get to eat some gingerbread treats while you are working on decorating your gingerbread train and gingerbread house. Of course with all the decorating supplies out the kids can also decorate their gingerbread cookies before they eat them. And if you want even more gingerbread holiday inspiration, Sweeten your holiday entertaining with Brandi Milloy’s easy Christmas baking recipe for a classic icebox cake made with Walkers Gingerbread Biscuits, Butter Toffee Pretzels and Salted Caramel Bark from Cost Plus World Market. Plus, see her cheery dessert table presentation. Imagine the joy you’ll bring. It’s easy to have the Polar Express movie playing while you decorate. 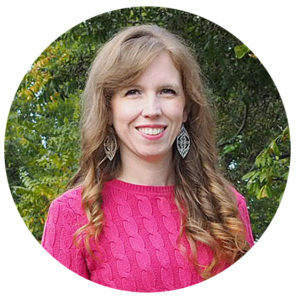 You could start or end the party with a reading of the book. And you can eat your cookies and drink some hot chocolate throughout the entire party!